Drawing on the theory that human speech has evolved from birdsong, composer Pete M. Wyer returns to Make Music New York with Professor Shigeru Miyagawa of MIT, who developed the theory. A choir of sixteen voices will be dispersed across the grounds of Brooklyn Botanical Garden singing slowed down transcriptions of birdsong to create the world premiere of "Twilight Chorus (for Humans)". 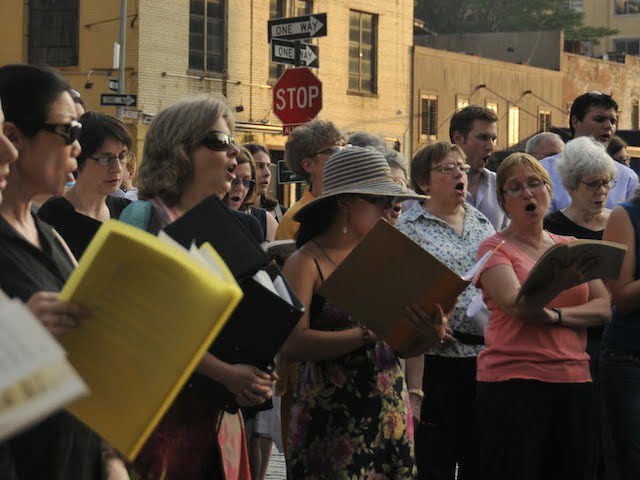 The audience is invited to experience the work by walking between the singers. As with much of Wyer's work, the piece celebrates the human as part of nature and follows a slow evolution of its own. Presented in partnership with Brooklyn Botanical Garden.